Sited off the Airport Road, Dubai International Airport (DXB) stands on the eastern side of Dubai Creek. Many major car rental agencies are represented at Dubai Airport, with 14 agencies in total to choose from. It is a good idea to reserve a car before your trip to Dubai, as car rental rates at the airport are usually cheaper if you book in advance. 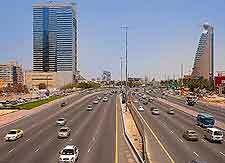 Dubai covers a sprawling area with many of its best attractions being best reached by car. Outside of the city centre you will find a host of golf courses, horse racing tracks and major holiday resorts, full of high-rise complexes. Driving around the city of Dubai simple. Roads are well-signposted, fast and wide, with a number of motorways featuring up to four lanes. However, the locals in the Dubai area are not the most considerate of drivers, often exceeding the speed limits and changing lanes without indicating. Those who choose to drive outside of central Dubai will find a map necessary, due to poor signposting and confusing road layouts. Traffic congestion and bottlenecks are also becoming a problem in some areas, such as the roads around both Jumeirah Beach and Deira. Local car parks in the city are managed by the Dubai Municipality, being easy to find and charged on an hourly basis, using orange ticket dispensers. A popular parking garage can be found at the Bani Yas Square in the Deira area. It is possible to purchase a parking card and use this at the majority of the meters at the Emarart Service Stations. Outside of Dubai's main central business district, you will find that many of the parking spaces are free. Book your Dubai Car Rental here.